Why bother with boutique paint? To start, many luxury paint brands offer deeper, richer and more complex colors based on high-quality pigments derived from minerals and clay. More complex pigments make for more interesting colors, and these paints can often provide better coverage and durability, too. Low volatile organic compounds (VOCs) are yet another benefit, as are a much wider variety of finishes. 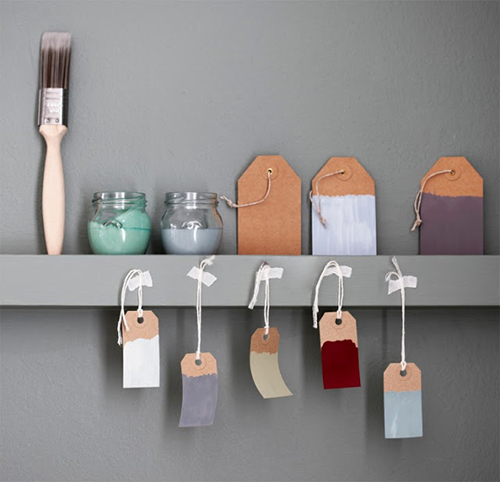 Here, we've chosen five of the top boutique paint brands we think you should know about. It's hard to conjure colors more evocative than those found on the English coast. 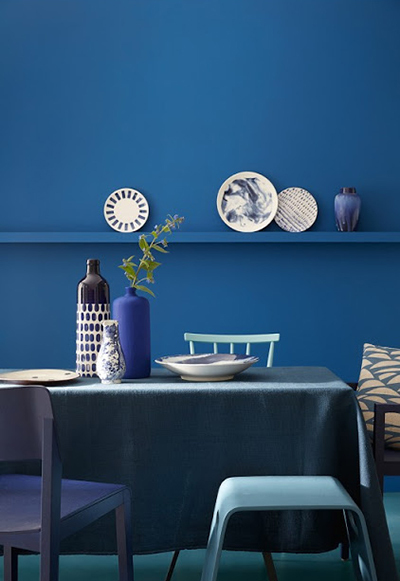 The earthy palette of brooding grays and moody blues are the hallmark of Farrow & Ball, the beloved boutique paint company founded in Dorset, England in 1946. 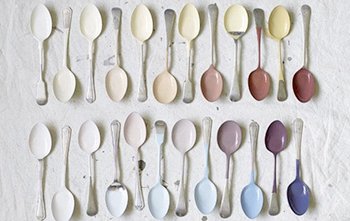 Farrow & Ball's historic colors for the National Trust. 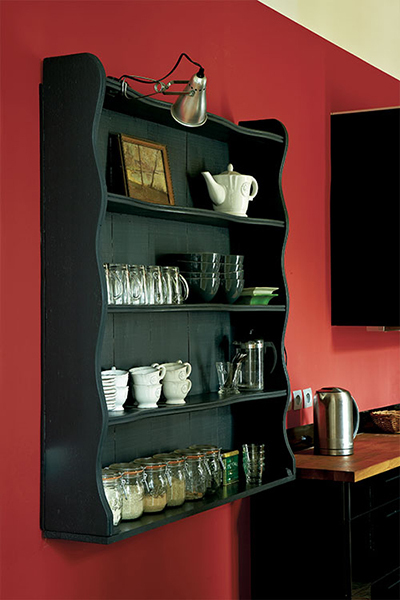 Farrow & Ball's paints are largely based on historic color palettes and archives. The company has worked with the National Trust in the UK to formulate matches for the restoration of historic building interiors and exteriors. The company’s evocative color names such as “Elephant's Breath” and “Dead Salmon” are as unique as the hues themselves. 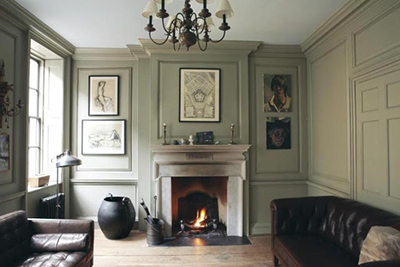 Farrow & Ball's French Grey No. 18, London Sone No. 6, and Blackened No. 2011. A fiery red from Farrow & Ball: Blazer No. 212. Another British manufacturer, Little Greene Paint Company began as the Little Greene Dye Works of Collyhurst Wood on the outskirts of Manchester in 1773. Joshua Rowlands, the earliest identifiable proprietor of the works, drew upon his experience making dye solutions for the cotton trade. 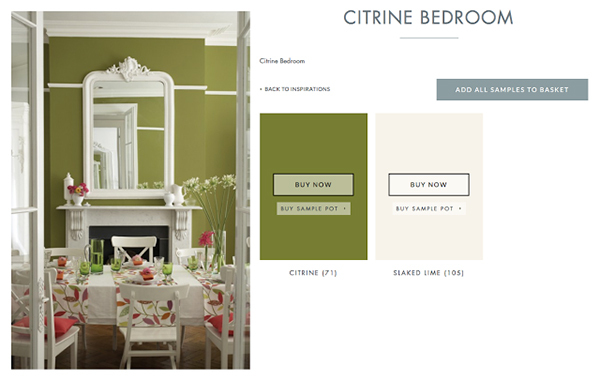 Little Greene Paint Company's Citrine (71) and Slaked Lime (105). 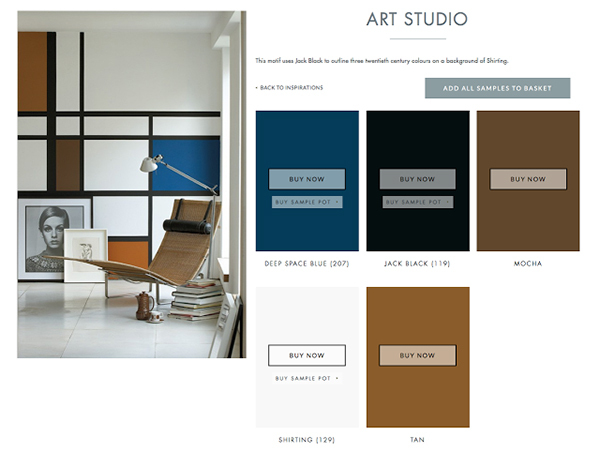 Little Greene Paint Company's Deep Space Blue (207), Jack Black (119), Mocha and Tan. Today its stable of palettes includes the England Collection of 128 classic and contemporary colors, and Color Scales, an assortment of 48 sophisticated neutrals in 12 families. 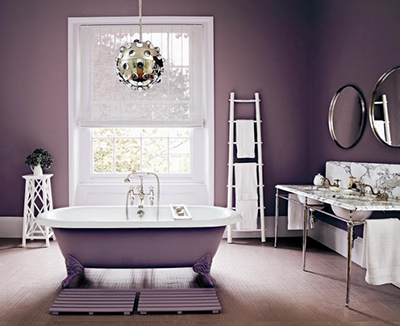 Little Greene Paint Company claims to contain 40 percent more pigment than ordinary brands, which result in richer color. Little Greene Paint Company's Mazarine (256). 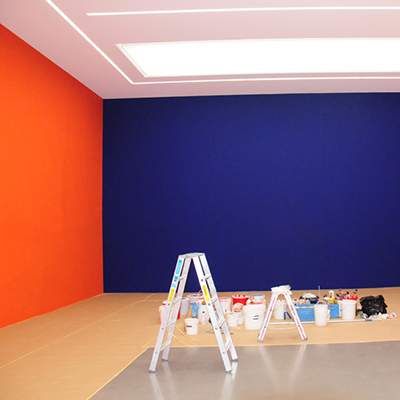 British-based Ecos Paints, whose client list includes the Louvre, contain no VOCs, toxins, or solvents. The water-based paints are all organic, and are completely odor and fume-free, according to the company. Ecos Paints are 100 percent organic, according to the company. This company receives the British Allergy Foundation seal of approval and offers 108 colors as well as a color matching service. At KT Color in Switzerland, Katrin Trautwein and her team handcraft pigment paint colors that are truly unique, using such rare pigments as chalk in Champagne, ochres from Burgundy, and lapis lazuli from the mountains of Afghanistan. As the company states on its website, "Connoisseurs of exclusive paints find theirs in our manufactory. While most others make paint with 12 tinting pastes, we scour the earth to find rare pigments." KT Color was founded by Katrin Trautwein. KT Color is the sole marketer of Le Corbusier's 120 colors, based on palettes he created in 1931 and 1959. 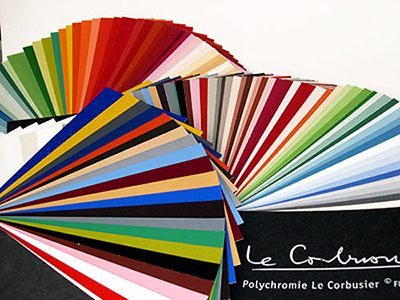 KT Color's Le Corbusier collection includes 120 colors. Pops of vibrant color from KT Color's Le Corbusier collection. KT Color's paints are handcrafted in Switzerland. A U.S.-based importer of high-end paints made in The Netherlands, Fine Paints of Europe has developed paint palettes by Martha Stewart and Pantone. The company offers a range of international color palettes including the National Color System, developed in 1750 by the Scandinavian Color Institute; and RAL, a color space system developed in 1927 with 1,900 colors. Fine Paints of Europe are crafted in The Netherlands and sold in the U.S.
Fine Paints of Europe has a number of curated paint collections, including the Guggenheim Colors. These are inspired by much-loved paintings at the Guggenheim Museum and favored by curators, artists, and designers, including Frank Lloyd Wright. Fine Paints of Europe's owner John Lahey claims that paints made by his brand will last 8-20 years. Fine Paints of Europe is a 25-year-old, family-run business whose paints should last up to twice as long as many commercial counterparts, owner John Lahey says. Boutique paint companies, such as the European brands highlighted above, are crafted to create richer, more complex colors. 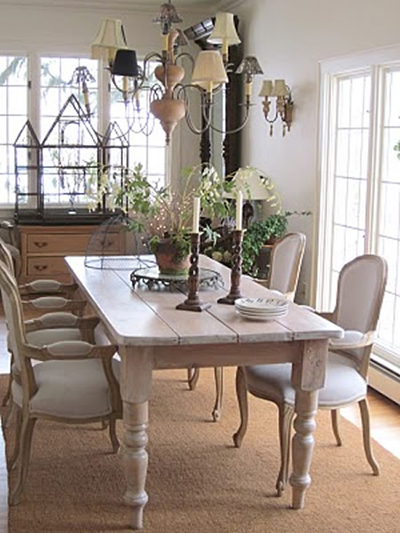 They offer a personalized approach to color that emphasizes quality of hue over quantity of colors. The paints are also made to endure. While the average American moves approximately every 4 to 7 years, Europeans are more likely to stay put for up to 15 years and expect their paint to last just as long. It's one of several reasons these specialty paints can outshine many of their more commercial American counterparts. Contact individual companies through their websites. Most offer fan decks and sample pots for purchase.